Trade Days 2000 was held in Trade, TN June 23, 24, 25. Javier Alarcon, an Aztec performer, has appeared in Trade for the past 5 years, bringing with him the Papantla Flyers both in 1997 and 1998. 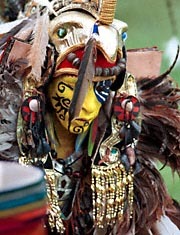 For a glimpse of their performance from 1998 see the Papantla Flyers page. In 1999 Javier was accompanied by a second dancer, Felipe Cortez Sarabia. This year Javier brought, not only another dancer, but musicians which provided live accompaniment to his performances. This seemingly simple addition magnified the energy many fold. Hours of preparations on Snake Mt. for the opening blessing ceremony which will be the start of Trade Days 2000. 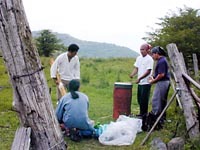 Performers (left to right) Miguel Angel Marroquin, Javier Alarcon (kneeling), Arturo Hernandez and Roger Cetina fine-tune the music which they will perform. 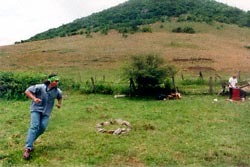 (Left) The circle has been cleared and energy begins to fill the gap in the mountain. (Right) Paint applied in dramatic patterns takes time and must last for a day of dance.